A very warm welcome to all of you. 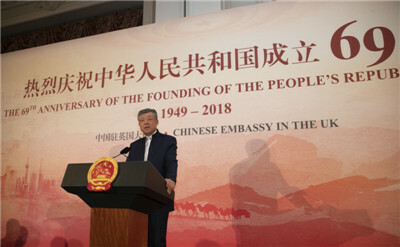 It is a pleasure to have you with us to celebrate the 69th anniversary of the founding of the People's Republic of China! "Now comes the most challenging time for the Chinese nation." This line never fails to strike a chord with every Chinese and evoke a strong love for the motherland. In time of life and death for the Chinese nation, this anthem had encouraged the Chinese people to strive relentlessly for national independence. In time of peace, this anthem reminds us to be always prepared to take on challenges. This anthem demonstrates the determination of the Chinese people to stay united against hardship and stand for peace. It is in this spirit that for 69 years, especially 40 years since the reform and opening up, the Chinese people have stood side by side, conquered various difficulties and achieved brilliant progress in our national development and rejuvenation. This year marks the 40th anniversary of China's reform and opening up. Thanks to 40 years of persistent efforts, China has achieved the great leap from getting on its feet to becoming prosperous and strong. In this process, the relations between China and the world have also experienced historic and fundamental changes. Reform and opening up have mapped out a new journey for China's national rejuvenation. Once the 13th largest economy, China is now the number two in the world. Our GDP has increased by 56 times. We have lifted more than 700 million people out of poverty, contributing to more than 70% of the world's total poverty reduction. And we have built the world's largest networks of social security and compulsory education. 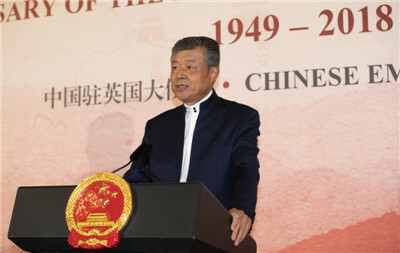 These achievements are attributable to the strong leadership of the Communist Party of China, to the development path that suits China's national conditions, and to the hard efforts of the Chinese people. These achievements are not accomplished by “stealing” wealth or technology from any country. Today, the Chinese people are striding proudly towards the goal of building a moderately prosperous society and a great modern socialist country in all respects. Reform and opening up have opened up a new prospect for socialism with Chinese characteristics. In the past 40 years, with a creative spirit and concrete steps, China has blazed a path of socialism with Chinese characteristics based on its national conditions. We uphold the unity of Party leadership, the running of the country by the people and law-based governance. Our overall plan is to promote the integrated development in five spheres including the economic, political, cultural, social and ecological areas. and strengthening the self-governance of the Party. The Xi Jinping Thought on Socialism with Chinese Characteristics for a New Era was adopted at the 19th Party Congress. This has been an important theoretical innovation of Marxism. Facts have shown that China has chosen the right path. It is a path that has led us to achieve great progress. It is a path that we will continue to follow. Reform and opening up have written a new chapter of a China that embraces the world. In the past 40 years, China has kept its door open to the world. This has led to increasing integration between China and the world. At the same time, China has been under more profound influence from the world. In 2001, China became a member of the WTO. In the 17 years since then, China made remarkable contribution to world economy and trade. It is now the largest trading partner of more than 120 countries. It has contributed over 30% of the world's economic growth for many years. It has become a stabiliser and powerhouse for world economic growth. Going forward, China will continue to embrace the world with open arms. It will continue to safeguard world peace, contribute to global growth and uphold the international order. Reform and opening up are creating new opportunities for the development of China and the world for many years to come. After 40 years of reform and opening up, China’s development has become more resilient and sustainable. China will continue to be a powerhouse for sustained growth in the world. and make $2 trillion of investment overseas. Chinese tourists are expected to make more than 200 million outbound visits. All these will mean huge opportunities to all countries in the world. China will continue to hold high the banner of inclusive and win-win cooperation. We will uphold the principles of extensive consultation, joint contribution and shared benefits in global governance. And we will take the lead in the new round of economic globalisation through cooperation on the Belt and Road Initiative. Our goal is to build a new type of international relations and a community with a shared future for mankind. In the past 69 years since the founding of New China, China-UK relations have withstood all weather and conquered various difficulties. Our relationship is now in a new stage of development. In 2015, President Xi Jinping paid a successful visit to the UK, which ushered in the China-UK "Golden Era". Since then, our two countries have created many "first's" in our cooperation across the board. Such cooperation has delivered tangible benefits to the people of our two countries. 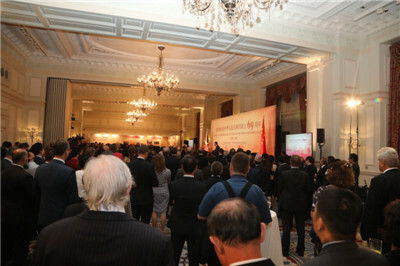 Today at the reception, some Chinese companies are displaying the benefits and achievements of their investments and operations in the UK. This is the best epitome of the China-UK "Golden Era". The world is experiencing profound changes unseen in a century. China and the UK are both at a critical stage of development. There is huge potential for further cooperation across the board between our two countries. To tap this potential, we need to match China's policy of deeper reform and further opening up with the UK's effort of building a "global Britain". China and the UK have every reason to keep up the momentum of the steady and sustained development of the China-UK "Golden Era". To do this, our two countries should uphold three principles. The first principle is mutual respect and mutual trust. This is important in building the "Golden Era". In advancing the China-UK relations, the two sides should adopt a long-term and strategic view. We need to put our relations in the larger picture of building a new-type of international relations and a community with a shared future for mankind. and handle our differences properly. This will enable us to keep the China-UK relations on the right track. The second principle is mutual benefit. This is important in gathering new impetus for common development. China and the UK should match our development strategies. We can deepen cooperation in traditional areas and explore cooperation on new industries and new models. In particular, high-standard and high-quality cooperation on the Belt and Road Initiative will help translate our complementary advantages and development opportunities into concrete outcomes. Next year, China will host second Belt and Road Forum for International Cooperation. This will be a new opportunity for the two countries to elevate our cooperation onto a new stage. We also look forward to a strong UK representation as a Country of Honour at the first-ever China International Import Expo in Shanghai on November 5th. It will be a good opportunity to introduce the British products and services to the Chinese market. The third principle is following the trend of the times. This is important in contributing positive energy to international cooperation. In today's world, peace and development remain the theme of our times, but unilateralism, protectionism and populism are surging, and international economy and trade face severe challenges. The world is standing at a historical crossroads. This is the moment for China and the UK, as countries of global influence, to display our vision and shoulder our historical responsibility. We must join hands to safeguard the rule-based multilateral trade regime. We must make greater contribution to world peace and development. Better life comes from hard work. China will continue to strive for national development and rejuvenation through reform and opening up. Meanwhile, China stands ready to work with the rest of the world, including the UK, to build a new type of international relations and a community with a shared future for mankind. Together we can create a better future for our planet! And to world peace and prosperity.